Mendocino Wines and vineyards continue to prosper, as the name MENDOCINO, and the special qualities of its wines, become increasingly well-known. Attention in the region has now turned to focus upon the particular grape varieties and wine styles that, in each particular Mendocino micro-climate, can produce the best and most distinctive wines. With the new vineyard locations and their different varietals, combined with skilled winemaking, specialized viticultural techniques, and a strong regional emphasis on green and organic grape growing, Mendocino grapes and the wines they produce are positioned for even greater acclaim in the future. 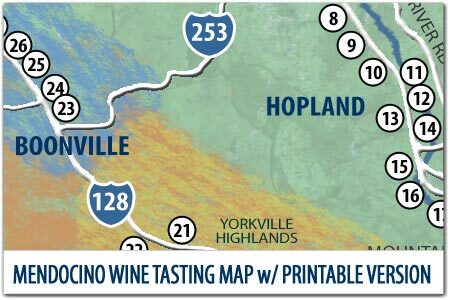 All of the tasting rooms on the map offer tastings on the weekends, most are OPEN DAILY. Join Their Wine Clubs and Save Even MORE! Testa Vineyards was established by their Great Grandparents Gaetano and Maria Testa in 1912. Stop by for Wine tasting, and a tour of this historic, family run vineyard with winery, and wedding venue with 3 bedroom vacation home!